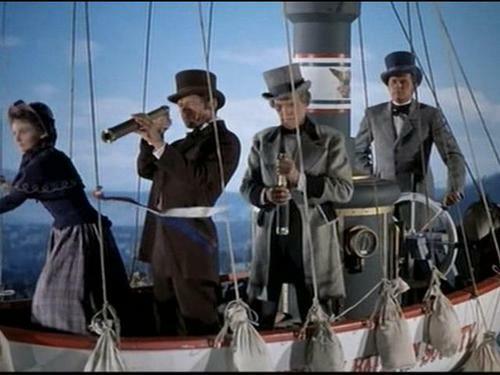 In the mid-1800s, a government official (Charles Bronson), two scientists (Henry Hull and David Frankheim), and Hull’s daughter (Mary Webster) are held captive in the airship of a mad pacifist (Vincent Price) who plans to destroy all the weapons in the world. 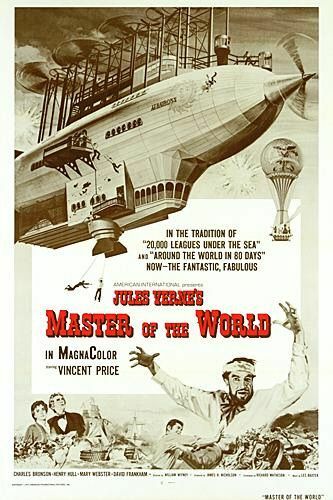 This AIP adaptation of two Jules Verne novels (Master of the World and its prequel, Robur the Conqueror) is based on the oxymoronic premise of enforced pacifism through violence. Unfortunately, despite this intriguing basis, the film itself — an erstwhile favorite of young audiences, especially when it appeared in later years on television — hasn’t aged very well. The cliched love triangle (between Bronson, Webster, and Frankheim) is sappy, the low budget is revealing, and the acting isn’t particularly noteworthy: Price is more subdued than usual, while method-actor Bronson (though serviceable) doesn’t impress. With that said, fans of Verne’s work — especially those who enjoy the similarly-themed 20,000 Leagues Under the Sea — will certainly want to check this one out. No. It’s unclear to me why Peary lists this title in the back of his book. First viewing since childhood. Not a must, but a mildly compelling tale for budding ffs and those interested in adventure sci-fi cinema history. My take is probably more forgiving than the one stated in the assessment; I think the film works well enough and is reasonably involving – esp. as it represents standard Verne territory. Richard Matheson’s script is appropriate for the genre and the cast is convincing if not much more – tho I do esp. like Webster’s controlled feistiness, Vito Scotti’s comic-relief cook, and the eye-candy addition of crew member Richard Harrison (who, not surprisingly, went on to a sword-and-sandal career in Italy). Somewhat better than one might expect (and it’s always hard saying no to a chance to see our dear Vincent, no matter what) – but hardly essential viewing.